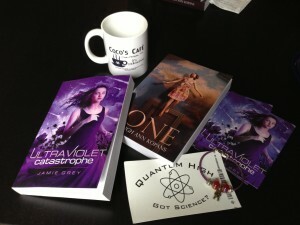 Robots, Coffee Mugs and Ultraviolet Catastrophe Giveaway! Everyone loves robots, right? Or at least the idea of them. (Don’t get me wrong, I’m still afraid someone’s going to invent a Cylon and destroy humanity, but that’s a post for another day). So in honor of that love, today I wanted to share an excerpt from Ultraviolet Catastrophe with you guys. 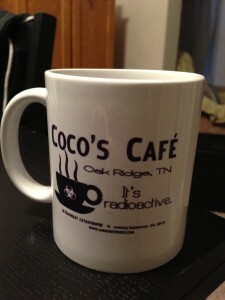 And tell you about a fun giveaway. Because OMG this book is going to be out in exactly A WEEK! First the excerpt. The set up: Lexie and her friend Max have just gotten a new school assignment and are going to the library to do some research. Max and I made our way to the third-floor library. He pressed a thumb to the print scanner, and the door swung open. Thick scientific tomes lined the walls, but they were only there as decoration. My eyes widened as I recognized the ultra high-tech computers that made up the real core of the room. I’d read about them online. They were super-fast, super-quiet, and linked to every scientific journal, library, newspaper, and article hub in the world. My muscles still quivered at Zella’s unexpected bitchiness, and I shoved the heavy door out of my way harder than I intended. It slammed against the wall, and the librarian glared at me, putting a finger to her lips. I froze. Her finger was made of metal. “Of course it does.” She looked almost human. Her face was covered with some sort of synthetic skin, and her short brown bob was neatly styled. If it hadn’t been for the metal arms, I would never have guessed she was a computer on legs. And because I love robots, and have perhaps added too many of them into this book (not possible! ), I want you guys to have a fun prize package! Use the Rafflecopter below to tell us what your favorite subject was in High School (or College or whatever). 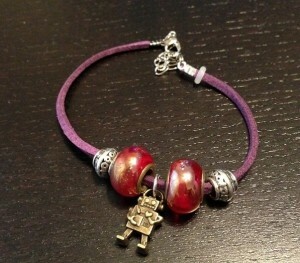 The giveaway will close at Midnight EDT on September 24th.